The process puts a magnetic field into the part. The piece can be magnetized by direct or indirect magnetization. Direct magnetization occurs when the electric current is passed through the test object and a magnetic field is formed in the material. Indirect magnetization occurs when no electric current is passed through the test object, but a magnetic field is applied from an outside source. The magnetic lines of force are perpendicular to the direction of the electric current, which may be either alternating current (AC) or some form of direct current (DC) (rectified AC). The method is used to inspect a variety of product forms including castings, forgings, and weldments. Many different industries use magnetic particle inspection for determining a component's fitness-for-use. 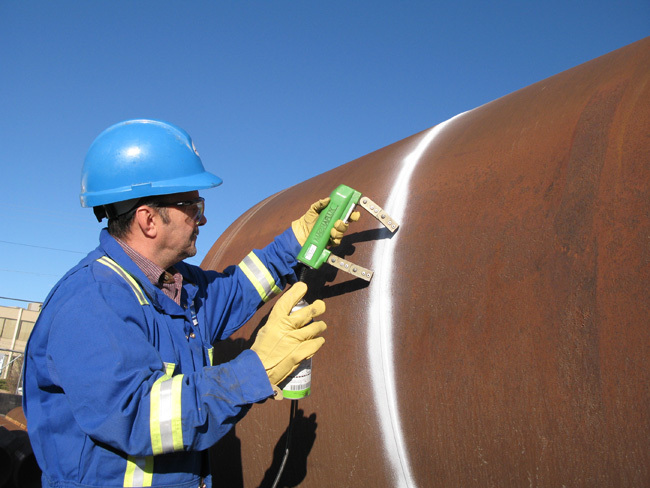 Some examples of industries that use magnetic particle inspection are the structural steel, automotive, petrochemical, power generation, and aerospace industries. Underwater inspection is another area where magnetic particle inspection may be used to test items such as offshore structures and underwater pipelines. 1. Can detect both surface and near-surface indications. 2. Surface preparation is not as critical compared to other NDE methods. Most surface contaminants will not hinder detection of a discontinuity. 3. A relatively fast method of examination. 4. Indications are visible directly on the surface. 5. Low-cost compared to many other NDE methods. 6. A portable NDE method, especially when used with battery-powered yoke equipment. 7. Easy to use and requires minimal amount of training. 1.Non-ferrous materials, such as aluminum, magnesium, or most stainless steels, cannot be inspected. 2.Limited subsurface discontinuity detection capabilities. 3.Each part needs to be examined in two different directions. 4.Only small sections or small parts can be examined at one time. MAGNETIC PARTICLE INSPECTION facilities at UIC, Jubail, KSA. 2. Experienced MT inspector for carry out difficult configuration of welds. 5. MT inspectors qualified and certified to Level II as per ASNT recommended practice SNT-TC-1A is approved & also BINDT (British institute of nondestructive testing) approved Level-II according to ISO 9712:2012 for carry out inspection.